PRODUCT NO LONGER AVAILABLE. Check back for updates. These Stainless Steel Travel Mugs come in a variety of colors! 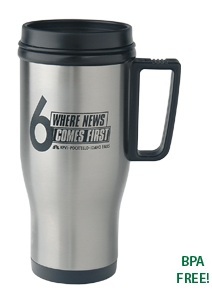 Each customized travel mug is made with stainless steel and can be imprinted with your personalized message. Each mug comes with a sturdy spill-proof lid. Long lasting and leaves a positive impression over its long life. An excellent advertising value. Give us a call (706-374-0710) for a FREE quote and to put our years of promotional and advertising experience to work for you.